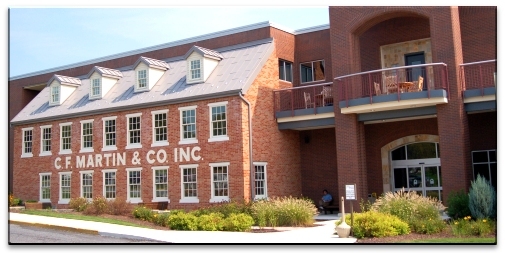 Special, Music, Industry, History -- Martin Guitar Company - Are We There Yet? 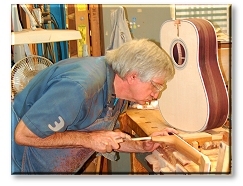 Anyone who appreciates fine music and particularly the sound of the guitar knows the C. F. Martin Guitar Company. The sound of a Martin is legendary, and legendary musicians use them -- Eric Clapton to name but one. 1983 marked Martin's 150th anniversary. Remarkably, the company continues under family management, reflecting five generations of dedication to the guitar maker's craft. The legacy began when Christian Frederick Martin, born into a long line of guitar and violin makers, left home to apprentice with Johann Stauffer, a renowned guitar maker. Upon returning home to Germany some years later to open his business, young Christian found himself caught in a bitter dispute between the Cabinet Makers Guild -- of which some members made guitars and the Martins belonged -- and the Violin Makers Guild. The vicious rhetoric hurled by the Violin Makers Guild in its effort to monopolize the musical instrument business could only be matched by a modern politician. Though the Cabinet Makers Guild retained its right to build guitars, Christian Martin became disillusioned with the guild system and emigrated to the United States in 1833, setting up shop in New York's Lower East Side. Martin's wife, upon visiting a friend near Nazareth, fell in love with the area. In 1838 Christian relocated his company to the beautiful town, and the rest is history. It's a great history of growth in an honorable business, out of which evolved the standards for the acoustic guitar in America today. Visitors can tour the Martin Guitar company, seeing first hand how these instruments are created. Though a modern plant and an assembly line are certainly faster than the lone craftsman of the past, the guitars are in fact hand made in a long, painstaking process. Involving 300 separate operations, it takes over four months to transform rough lumber into a Martin guitar. From bending the Indian rosewood for the body to forming and bracing the tops and backs (and hand-shaving the braces to maximize resonance) to shaping the mahogany neck, assembling the parts and applying all final finishes, each instrument is handled as an individual -- work is so precise that necks and bodies are not interchangeable between Martin guitars. Finally, each guitar is vacuum-sealed in a case for shipping. The tour includes a Museum which houses a priceless collection of unusual and vintage Martin guitars. The hour-long tour is inspirational, educational, and enjoyable to people of just about any age. Individuals and groups are welcome. Hours: Museum and Visitors Center open Monday thru Friday, 8:00am - 5:00pm. The Guitarmakers Connection (Old Factory) open 9:00am - 4:00pm. Guided Factory Tours conducted at regular intervals between 11:00 am and 2:30 pm, Monday through Friday on a first-come, first-served basis. Group Tours are scheduled between 8am and 10:30am. Admission: FREE for families and individuals joining a scheduled tour. Groups: Nominal fee for Group Tours. Group Reservations: At least 2 weeks in advance recommended. Handicapped Access: Call with needs. Directions: I-76 (Schuylkill Expwy.) West to I-476 Northeast to Mid-County Interchange Northeast to Rt. 9/PA Tpke NE Ext. (Northwest) to Rt. 22 east to Rt. 191 North into Nazareth. Continue on 191 (Broad St.). Right onto St. Elmo St. (Nazareth Park on left), left onto Sycamore. 60 - 90 minutes north of Philadelphia.